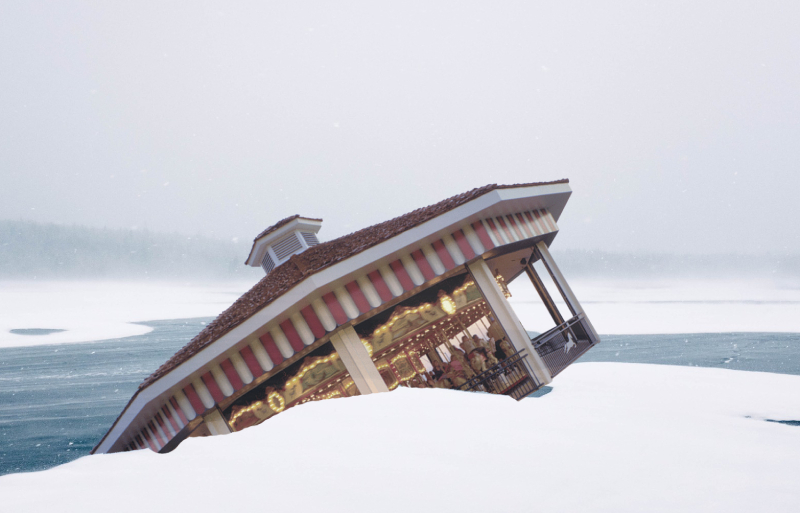 NORTH BAY — The North Bay Heritage Carousel has been lost at sea, or rather, to Lake Nipissing. The carousel, which measures 28 feet across and boasts 18 fully carved wooden animals, broke from its cement paddock late Wednesday evening, and slid down to Lake Nipissing. There, its immense size both propelled it far onto the ice and then sunk the beloved children’s ride. City workers are blaming a heavy spring thaw and a lack of funding for winter maintenance. North Bay City Police report only minor injuries as the carousel carried three pedestrians, two Honda Civics, and a cat on a leash out with it onto the ice. Local fisherman Bishop ‘Two-Teeth’ Bradley was an eyewitness to the carousel’s escape, launch, and sinking. Bradley says the carousel travelled “two leagues” out onto the ice, before a “mighty crack, like the whip o’ Lucifer himself” sounded and the structure sank. 40 fathoms? Lucky if you can find a spot 40 feet deep on Lake Nipissing. I wouldn’t trust Two Teeth Bradley as far as I could throw him but the picture doesn’t lie. Two Teeth is the guy that first taught PhotoShop in North Bay. Ol’ Two Teeth was my first PhotoShop teacher. Very creative folks. Great story. Seems their is always a lack of funding in North Bay no surprise there. So much love and time went into that project. Shame on all of you at City councel for not maintaing this structure. My condolences to the good people of North Bay. I’d expect this on April 1. I gather it is an April fools joke. This is so sad we were there last summer and all my cousin’s children had such a wonderful time on that carousel! Some of the children had come all the way from Florida. My adult daughter called me from up North,so upset about the loss of the horses. I told her it can not be true. Just look on the News Headlines on the right. Council takes pay cut ,to help us taxpayers, and I’m still laughing,in fact Roaring with laughter,cannot stop. You actually had her fooled ! She’s getting rid of this site. I think it’s good humour that we all need. Pay Cut ? That headline gave you away.hahahahahahahahaha. Laughing all the way to the poor house. I’m at the very front of the line at the soup kitchen….Keep these great stories up, we all need some laughter. Haha.. very creative writing! Fantastic job! If anyone of you have nothing nice to say, keep it to yourselves. What a world we live in. This news is heart breaking! Thanks for making my day…. Good grief is it April fools already???? Must have a long coard, (the lights are stil on) lol ! I seriously love how people fall for these stories. This site is too funny! So would this now be a Merry-Go-Down? Good job, well written. This made me laugh almost as much as some peoples comments who believe it.